“It’s going to tell you things that I still love you too much to say.” Elvis Costello wrote those words for 1989’s startling ‘Deep Dark Truthful Mirror’. It’s the writer’s job, that… to reveal things about ourselves using the mirror art holds up. In theatre, you have to believe in the work to see it. Introducing Ian Salmon. By Alan O’Hare. It was 2008 and I was writing about ‘a revolution on Roe Street’. The Royal Court had turned its back on music, had a rejig and put its faith in theatre and homegrown writers. We all remember the broad strokes of ‘Brick Up The Mersey Tunnels’ (and its ridiculous sequel), but it was the likes of Dave Kirby’s ‘Lost Soul’ and retreads of Willy Russell classics such as ‘Stags and Hens’ that seemed to provide the place with the gravitas it needed to start again. Since then? That’s another story. But what has also happened since that time – away from the now-stunted revolution on Roe Street – is that a door has opened, slightly, and Liverpool playwrights such as Lizzie Nunnery and Ian Salmon have waltzed in and brought grace, humour and pathos to stages often filled with bombast (up the hill) and bluster (down it). Tell me a bit about your background – has writing always been with you? I intended to write comics. I wanted to be Stan Lee. I was a one hit wonder with comics (wrote a story called ‘Waltz’ for Revolver), but life somehow interrupted and I ended up working in a record shop for twenty seven years. Then I was made redundant and I was fortunate enough to not have to work for a year or two, so I started writing. What was the catalyst to write plays? I moved into plays accidentally through a writing group and wrote ‘Venus Rising’ as a one act monologue for the ‘Page To Stage Festival’. Being in a room with actors and a director, you get the bug… ‘These Two Weeks’ is now the fourth play I’ve self-produced and I’ve just put the full-stop on play number nine. Let’s talk about ‘Those Two Weeks’ – it had an impact, didn’t it? I was absolutely blown away by the reaction to the first run. The audience reaction to the show has been everything I hoped for and far, far more than I could have ever anticipated. We’ve had comments from people to whom the subjects that we touch on in the story are incredibly, painfully, personal experiences that have absolutely humbled all of us involved in the play. I won’t give too much away, but were you intimidated by the gravitas of the events the play spotlights? Incredibly so. I didn’t feel I had the right to tell certain stories, but what I felt I could write about was what it was like for me and my family. What I felt most strongly was that I could talk about what it was like before… what it was like the last time that the city was normal. … it all started with a conversation between my wife and I. We went for coffee one Christmas Eve morning, the first Christmas Eve that I’d not worked in my entire life, and we talked about what I’d write next. J, my wife, was talking about writing something real and grounded in our own lives and was talking about a Robert Pattinson film, ‘Remember Me’, which was about 9/11 without being actually about it; I compared this to a Paul Auster book, ‘Brooklyn Follies’, which dealt with the same subject in a similar manner with you only realising what the book was about on the last page. J said: “Why don’t you write something like that about our lives?” Then the conversation turned into talking about the fact that there was one moment that towered over our generation’s entire lives, for everybody in Liverpool, there is before Hillsborough and after. But I didn’t know if I should write about it. My brothers were there, in the end pen rather than the centre, and I wasn’t, I was in work. I’ve talked to them about what they went through, but I didn’t experience it… I can’t feel what they felt. The message that I wanted to give about Hillsborough, by talking about normal life before it, is that all of us who didn’t lose anybody know how fortunate we are, know how easily it could have been us. 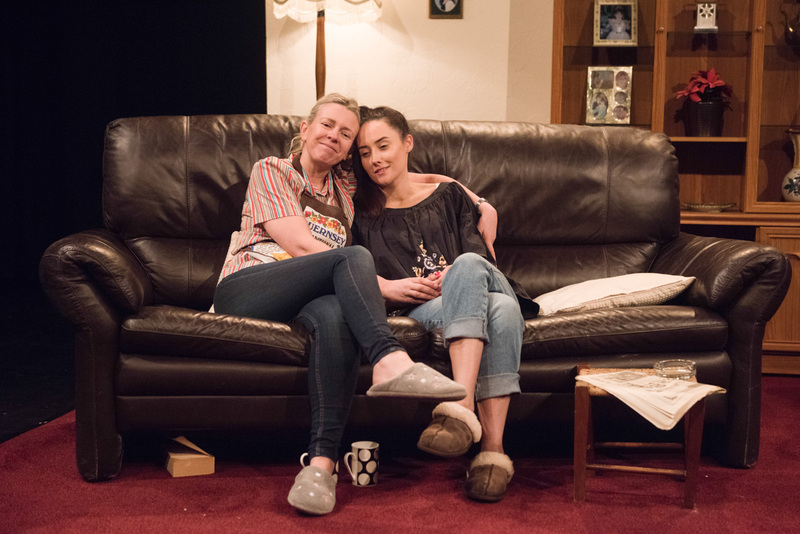 … I can’t emphasise enough that there’s a very serious heart to the play – but there’s a huge amount of humour in it. It’s about the way that a working class Liverpool family, very like my own, relates to itself and that means that, even in times of personal stress, there’s somebody more than capable of getting a laugh. And then there’s the end. I know the point that we want to make with the end, which takes place on the night of the fourteenth, and it’s about being young, in love and ready to take on the world. It’s very much taken from the early days of myself and my wife… and each night we reached a certain point where I was in tears because what I was seeing on stage was how we were back then and we obviously have no idea what is about to happen. The cast are incredible and every single performance adds something that I didn’t see when I wrote it. It would be appallingly remiss not to mention the director, Mike Dickinson (who creates massive madcap comedies under his own company, check out the brilliant ‘Bob The Russian’), who took this on as the most realistic play he’d ever undertaken and brought an incredible lightness of touch and attention to detail to it. Between all these wonderful people, they’ve made my words into something real. That’s what we all go to the theatre for, isn’t it, that deep and dark truthful mirror? There were a few points that I wanted to make with this play and that the director and cast got completely as soon as they read it. We wanted to show a true portrayal of working class life in the eighties and how aspirational the working class are and always have been, as there are lots of media outlets who’ll tell you otherwise. We also wanted to show how difficult family life can be at even the most straightforward of times, that a family can fall apart with the most innocuous of comments and that holding it together is vital; that everything we go through is exactly what our parents went through at our age, that our children are going through what we went through and that we all make mistakes. What else are you up to, Ian? I recently shared my superhero novel, ‘Legacy’, online for free over one weekend and had a few hundred downloaded; whilst the Liverpool Football Club book I wrote, ‘They Say Our Days Are Numbered’, brought me to a couple of signing sessions at Waterstones. What about bubbling under the surface? I’ve just finished my entry for this year’s Liverpool Hope Playwriting Prize. I love the ambition of the prize and that it wants to create new comedy. I love the doors that the ‘Highly Commended’ award opened for me and I really want to win it: I want a play on that stage. I’m currently working on two musicals. ‘Girls Don’t Play Guitars’ is the true story of The Liverbirds, the world’s first all-girl rock ‘n’ roll band; four Liverpool girls who went to Hamburg in the sixties and never really came back. Massive in Europe, supported Chuck Berry, smoked weed with Jimi Hendrix, knew the Stones and the Kinks. I’ve worked on this with music journalist Paul Fitzgerald and Mary and Sylvia from the band are totally behind it… there are conversations ongoing and I’ve a new draft to write. ‘Silver Meadows’ is built from the album of the same name by Vinny Peculiar, one of the great unheralded treasures of British songwriting. We’re working on this with Liverpool Arts Society and I want to see it onstage next year. Before we leave it, I can’t get the phrase ‘the last time Liverpool was normal’ out of my mind. Talk to me. I don’t believe there has been a normal day for Liverpool since April 1989; everything ever since has contained the after effects of the day. That the struggle for justice has lasted so long has meant that it’s always there; most obviously for the families who lost loved ones and also those who survived the central pens, but also for all those who weren’t there but know those who lost family and know those who suffered. As a city I think the need for public awareness has defined who we are and what we do. It also struck me that it’s always been easy to think of the 96 as a unit, but every single one was an individual with ambitions and desires and relationships and interests that you didn’t necessarily think of from outside. What it reinforced was the working class that I grew up in, the aspirational Liverpool working class. And that was the first thing that I wanted to honour in the play. The second thing that I wanted to honour was the relationship between my late father, a lifelong red, and my wife, a lifelong blue from a family of blues. I wanted to show how we are basically never divided by split allegiances but that we can be equally passionate and identify with each other. There are so many families exactly like ours and I wanted to reflect that. So, ‘the last time Liverpool was normal’ is, for me, a shorthand way of expressing everything that was changed, everything that was taken away.